Ananda Sarath Kumara Who Forced Lady Teacher To Kneel Down Before Him Publicly is Appointed SLFP Anamaduwa Organizer by Maithripala Sirisena. Amomg the changes according to reports in Colombo newspapers is the removal of former state minister and Puttalam district MP Priyankara Jayaratna who has been removed as SLFP organizer for Anamaduwa electoral district. Jayaratna has been replaced by ex- North Western Provincial councillor Ananda Sarath Kumara. Whatever may be the reasons for Sirisena’s choice of Ananda Sarath Kumara the appointment is causing a storm of protest among those regarded as members and supporters of the SLFP faction led by Maithripala. The reason being the notorious reputation of Ananda Sarath Kumara who is a thuggish bully and tough guy. He is a man who incurred the wrath of the teaching fraternity in the Wayamba province and the condemnation of all decent persons in Sri Lanka during the Rajapaksa regime. 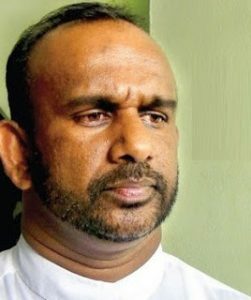 Sarath Kumara then a United Peoples Freedom Alliance(UPFA)Provincial councillor from the North western province , was responsible for forcing a Lady teacher to kneel down before him in public before teachers and students of the school she was attached to. The infamous incident occurred on June 14th 2013 at Navodhaya Maha Vidyalaya in Nawagattegama in Puttalam district of the North Western Province. Earlier the lady teacher Ms.Priyani Susila Herath who was in charge of discipline at school had admonished a schoolgirl for wearing her uniform shorter than the prescribed hemline level and ordered her to remove the stitches to make it longer. Apparently the teacher was compelled to take such action because she had repeatedly warned the student about the uniform length who had not obeyed the directive. The student was the daughter of Provincial councillor belonging to the ruling UPFA Ananda Sarath Kumara. Upon hearing of the punishment meted out to his daughter an infuriated Sarath Kumara had stormed into the Nawagattegama Navodhaya school carrying a heavy pole.He was accompanied by a gang of his “catchers”.He was apparently intoxicated. The UPFA Provincial councillor had started abusing the teacher threatening physical harm and demanded that the teacher kneel down before him.She had refused to do so but the vice-principal and other teachers were terrified and had compelled her to do so. With her fellow staff members buckling under Sarath Kumara’s threats the shocked teacher had then knelt down on the ground in front of the provincial councillor in full view of the teachers and students. Sarath Kumara had then said the school assembly should be held on Monday and the teacher should apologize to his daughter in front of all teachers and students.He said the teacher should kneel down in front of his daughter and worship her. The teacher should also clasp his daughters feet and ask her for pardon. He had then compelled the teacher to fall at his feet again. After the complaint was lodged the students started shouting that action should be taken.The Police assured them that they would follow up the complaint.Meanwhile teachers trade unions were also alerted.Teachers union representatives started to follow up the complaint and lodged protests at multiple levels if the Government. They also launched demonstrations.The media too started giving wide publicity. The entire nation was shocked. As pressure mounted the then President Mahinda Rajapaksa intervened and instructed that immediate action be taken. He also telephoned Ms.Herath and promised that remedial action would be taken. The ex- presidents action was publicised and received a lot of praise.The Police took action and took Sarath Kumara into custody on June 15th. He was later produced before the Puttalam acting magistrate Mohammed Iqbal who remanded him. Sarath Kumara was taken to the Negombo jail. Subsequently UPFA Puttalam district MP Arundika Fernando along with Private secretary Asela Dias and media secretary Sumith Galvitige went to the Negombo remand prison and met Sarath Kumara. He was asked to submit his resignation from the Provincial councillor post pending further inquiries. Sarath Kumara remonstrated saying he was innocent. He was then asked to write another letter giving his version. Sarath Kumara did so saying that the complaint against him was a conspiracy by his political opponents and that the alleged incident had not happened at all.Sarath Kumara was then told not to worry and that matters can be “shaped up” in due course. The letter addressed to former President Rajapaksa was delivered to him. Copies of the letter were also sent to the General secretaries of the UPFA and Sri Lanka Freedom Party(SLFP). Another copy was taken personally by Provincial councillor Indrani Dassanayake to the then NWP governor Tissa Balalle. Mahinda Rajapaksa then ordered Arundika Fernando to release the contents of the resignation letter to the media. This was done but the other letter was not divulged. Mahinda Rajapaksa then instructed Balalle to probe the matter and submit a report to him. Meanwhile the lady teacher Ms. Priyani Susila Herath was undergoing much stress and strain. She found it difficult to continue teaching at Navodaya.Her case was treated sympathetically and at her request Ms.Herath was transferred to the school in which her husband was teaching. She is yet to take up duties. Ananda Sarath Kumara now tried to deny the entire incident saying that he had not even gone into the school on that day.A group of thugs connected to him started an intimidation campaign. They began riding their motor cycles in a group and hovering around the residences of Ms.Herath and the other teachers cited as witnesses in the Police complaint.Rumours were also spread that teachers and students at Navodaya school would be attacked if Sarath Kumara was not released safely.As a result of this campaign a climate of fear prevailed at the school. Adding further pressure was the conduct of some senior Education department officials in Puttalam with close links to Sarath Kumara. When school teachers in Puttalam wanted to strike en masse in protest over the incident these officials stepped in and through coaxing and coercion prevented such action. Worse still was to follow. A very senior regional level education department official personally contacted the vice –principal and six teachers cited as witnesses to the incident to retract their testimony. They were “advised “to distort the truth by saying that none of them had seen the reported incident on the day concerned. Otherwise they would face consequences was the warning given. While these moves to suppress the truth were going on the then NWP governor Tissa Balalle when contacted by the media responded in a manner that suggested he was partial towards Sarath Kumara. The Governor told the “Ceylon Today”newspaper that the then President Rajapaksa had requested a report on the issue and that he was compiling it. “Sarath Kumara is saying he did not do anything, while the other side is saying he’s guilty. The police arrested him based on that complaint,” Balalla said. In a pathetic confession of the prevailing environment the then school principal MTM Samaratunga told “Janarala” that the affected teacher should have handled the matter quietly and not made an issue of it.The principal reportedly said that he himself had been threatened and abused by Sarath Kumara several times. Even his motor cycle was burnt once by Sarath Kumara but he had not made an issue of it. Samaratunga said that even he as a principal had always kept quiet and not made a noise and that the teacher too should have resolved the problem that way instead of making a fuss. Against this backdrop it was quite clear that Ananda Sarath Kumara was a thuggish character who terrified the school and staff. Ms.Herath’s act of complaining against him was therefore an act of defiance which made her extremely vulnerable. However the incident had shocked and rocked the entire nation. Unions representing teachers took up the case and extended full support. The media too was on the side of the teacher.There as a huge outcry that justice should be done. The Rajapaksa regime had to let the rule of law prevail and prevent obstruction of justice. After protracted trial Former North Western Provincial Councillor Ananda Sarath Kumara was sentenced to two years rigorous imprisonment suspended for seven years. Puttalam High Court Judge Priyantha Fernando handed down the sentence on May 12th 2014. Representatives of several teachers’ unions also gathered at the court premises waiting for news on the sentencing. Handing down the sentence, Puttalam High Court Judge Priyantha Fernando ordered the suspect to pay a fine of Rs. 50,000 adding that he would serve a prison term of six months in the event of failure to pay the fine. The court also ordered Ananda Sarath Kumara to pay compensation amounting to Rs.300,000 to the victimised teacher. The court also ordered that he serve a one year prison term if the compensation was not paid by 2 o’clock Monday afternoon. The compensation was subsequently paid to the victim by the former provincial councillor. The affected teacher told media that she wwould use the compensation money to establish a scholarship fund for poor children in the area.The victimised teacher, Susila Shriyani Herath expressed her intention to the media then. Perhaps the teachers in Anamaduwa may have to kneel down and fall at the feet of the new SLFP organizer again!